Last night the wife and I began our final journey through the realms of Tyria, Cantha, Elona and the Far North in one of our favorite games – Guild Wars! We were able to log some time in Guild Wars, probably one of the last major times we will do so, before the launch of Guild Wars 2 on 8/28/12. It was a fun reminder of how far we’ve come as a couple and in the game since we started playing in April 2005. We’ve gone from Dating to Married, Condo to Town home, crappy computers to newer slightly better computers (they age over time ya know! ), no kids to two kids. I learned about Guild Wars prior to them launching their open beta and was excited from the beginning to hear of an online role playing game without a monthly fee. At the time, my wife and I were only dating and living 5 hours apart in different states. I had hoped to find something we could play together long distance. The game took its time getting to beta and by then we were engaged and living together – so we were able to play side-by-side. 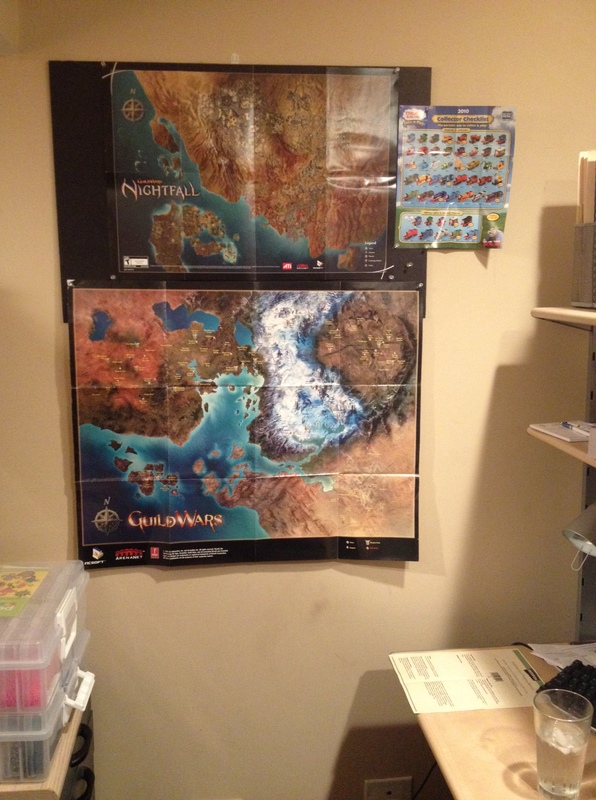 We spent many long nights (and days) playing through the different areas of the world of Tyria. If we were fortunate to have a completely open Saturday, we would partake of some adult beverages and dive into an enormous delivered pizza and game all night long. It was pure heaven and something we can no longer do. We had limited time and have a toddler who still wakes up 1-2 times before midnight so we knew that we were on borrowed time (as we always are now with kids). Thankfully we were able to play uninterrupted for a little bit. Hopefully we’re able to squeeze in a little more time over the coming weeks prior to the launch. The newly added quests serve as a swan song to Guild Wars 1 and takes players across all the realms to popular, picturesque destinations. The last quest we finished was a visit to a beautiful, Kodak-picture spot called “The Falls” in the Magumma Jungle. We should have visited these falls over 7 years ago but apparently have no memory of it. So even while the game was attempting to help us relive moments that we should have previously experienced, we visited at least 2 destinations tonight that we both failed to remember. Amazing how something that they were able to create a world so rich with detail and expansive with exploration that we were able to possibly miss something – and were able to experience it again (for the first time) tonight. We should all be so fortunate to have just a little bit of this wonder from time to time. 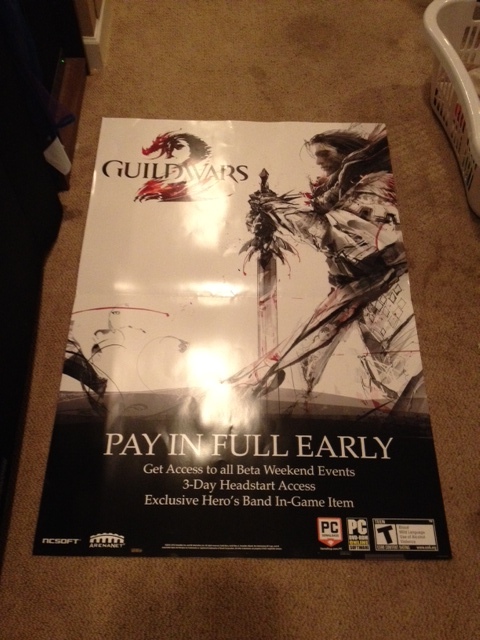 And we even managed to secure some “Coming Soon” posters from our local Gamestop. Not quite sure where to put those! They’re huge!